So close, yet so far! 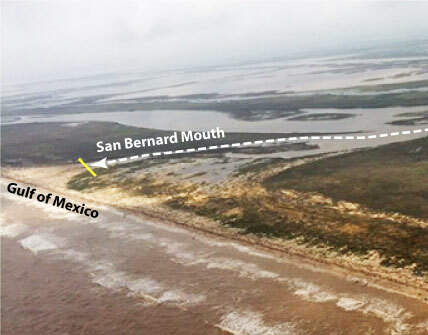 Despite the power of recent flood water pushing down the San Bernard, the mouth remains closed. The water stopped at the yellow line indicated in the photo several feet from the Gulf. Hopefully, there will be good news in a few months about it being reopened. Read “BP Consent Decree Finalized: Where it Leaves Gulf Restoration Six Years After the Spill” ($1.0 billion to Texas, the smallest amount to be received by any of the Gulf states).